NASA GISS: NASA News & Feature Releases: Who CARES About Carbonaceous Aerosols? Who CARES About Carbonaceous Aerosols? Dozens of scientists descended on Sacramento, Calif., in June hoping for what most of us don't want to see during hot summer days: thick, sooty haze. The team of some sixty researchers from across the country and several universities and government agencies, including NASA scientists and aircraft, took to the skies to sort out one of the stickiest questions in climate science: What effects do tiny aerosol particles in that haze, particularly those containing carbon, have on the Earth's climate? Small bits of everything from smoke to sea salt to dust to soot inevitably find their way into the air. Many of the particles wafting about are rich in carbon. These carbonaceous aerosols come in many forms, but most often from remnants of motor vehicle fumes and partially burned bits of wood and vegetation from wildfires and agricultural burning. Some carbonaceous aerosols even appear out of thin air, as both man-made and natural volatile gases can react in the atmosphere to produce the particles. Carbonaceous aerosols are thought to have a significant impact on Earth's climate. The darkest type — black carbon — readily absorbs incoming sunlight and can warm the atmosphere. And many types of carbonaceous aerosols can seed clouds, therefore altering precipitation patterns. Yet many aspects remain unknown, such as how carbonaceous aerosols change their shape and light-scattering properties with age. And researchers have only recently begun to recognize the importance of a complicated class of carbonaceous aerosols — dubbed brown carbon — that only partially absorb light. "We have a lot of work to do before we're capable of measuring the size, shape, and absorption of all these aerosols, not to mention estimate their climate impact, with much accuracy," said Michael Mishchenko, a scientist at NASA's Goddard Institute for Space Studies (GISS) in New York City. The NASA team's trip to Sacramento, one of many field campaigns the group has joined in recent years, is part of a larger effort to characterize the problematic particles. The U.S. Department of Energy led this year's Carbonaceous Aerosol and Radiation Effects Study (CARES) month-long campaign. 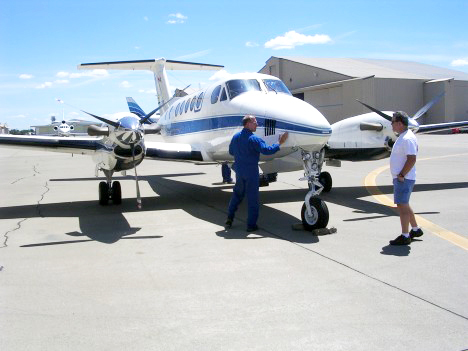 Researchers took simultaneous measurements from a Gulfstream G-1 aircraft operated by the Pacific Northwest National Laboratory, NASA's King Air B-200, and ground-based stations. The campaign was coordinated by Rahul Zaveri of the Pacific Northwest National Laboratory. Investigators from the California Air Resources Board, the National Oceanic and Atmospheric Administration, the California Energy Commission, and a number of other institutions have also played a role in the campaign or will participate in the analysis of the data. 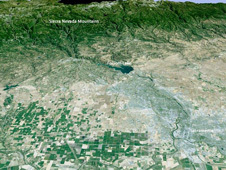 A key goal of the effort was to understand how man-made, urban aerosols such as black carbon and sulfates interact with aerosols produced naturally by forested areas near Sacramento. 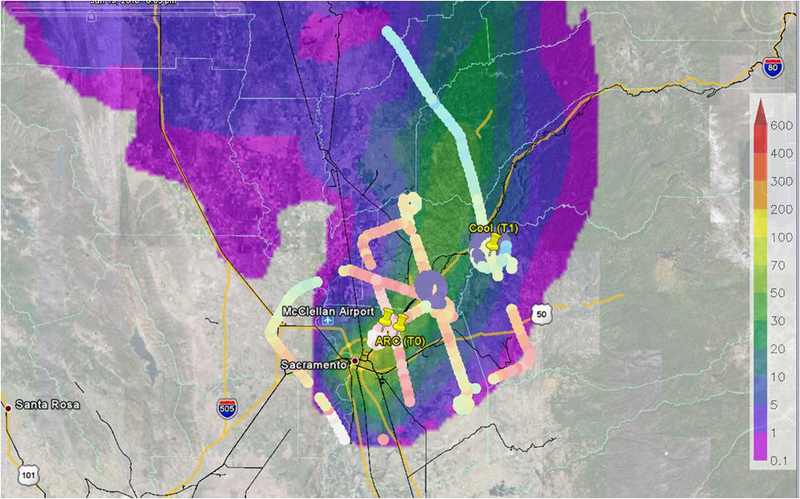 Sacramento is an ideal location to untangle natural and urban aerosols, explained GISS aerosol scientist Brian Cairns, because winds consistently blow Sacramento's plume in the direction of forests to the east in the afternoon. That makes it possible to track Sacramento's urban plume in the morning, and then watch it closely as it mixes with the natural emissions from the forests later in the day. Unanswered questions about aerosols make them one of the least certain parts of global climate models, according to the last Intergovernmental Panel on Climate Change (IPCC) report. "As opposed to greenhouses gases, whose properties and impacts are relatively well known, there's a good chance the uncertainties associated with aerosols are even larger than IPCC estimated," Cairns said. Yet getting the details right is critical in order for scientists to predict what the future climate might look like. "Just from the measurement standpoint, you've got to be able to look at the small scale, like we're doing with these aircraft measurements, to see how those processes work," said atmospheric scientist Richard Ferrare of NASA's Langley Research Center in Hampton, Va. "You also need global measurements from satellites. Then you need to improve the models. There are a lot of things involved in reducing the uncertainty." 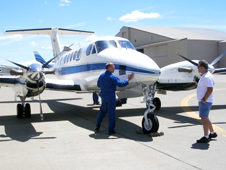 The NASA scientists working on CARES believe that two instruments that flew aboard NASA's B-200, the Research Scanning Polarimeter (RSP) and the High Spectral Resolution Lidar (HSRL), represent some of the best hopes that scientists have for getting answers. Most instruments look at the intensity, or amplitude, of light waves as they scatter off aerosols. The RSP, managed by scientists at GISS, takes the next logical step and measures a property of light — its polarization. RSP measures the angle at which light waves vibrate as they bounce off aerosols and move through space. With this measurement, scientists get a more complete view of particle characteristics, explained Matteo Ottaviani, one of the GISS scientists who went to Sacramento. The RSP, which has taken measurements all over the world, is so promising that NASA plans to launch a satellite version of the instrument, called the Aerosol Polarimetry Sensor, later this fall on the Glory satellite. Langley's HSRL provides a vertical profile of aerosols, instead of the "bird's eye view" of many airborne and satellite instruments. It does so by sending pulses of laser light downward that illuminate aerosols, and then measuring the light they scatter back. A vertical profile, according to Ferrare, gives scientists perspective on how aerosols are formed and transported in the atmosphere. The optical properties and vertical distribution of the aerosols play a significant role in how solar radiation escapes from or gets trapped in the atmosphere, making HSRL measurements important for understanding climate and climate change. The HSRL provides measurements similar to those provided by the lidar onboard the CALIPSO satellite, which has provided global measurements of aerosols since 2006. The HSRL also provides additional measurements that can be used to distinguish aerosol type and so can help identify aerosols that may be significantly absorbing solar radiation. "There's still a great deal of work to be done, but I believe these two instruments and their satellite counterparts will play a critical role in sorting this out," said Mishchenko. In the meantime, much of the work has just begun for the broader CARES team. "The end of the field portion of the CARES study marks the beginning of the long journey ahead that entails analyzing the data, presenting new findings at conferences, and publishing the results in peer-reviewed scientific journals," said Zaveri. This article was originally prepared by Adam Voiland and Patrick Lynch as a NASA Portal Looking at Earth feature.